Canberra’s international visitor numbers are set to rise following an exciting new appointment in Singapore aimed at luring more South East Asian travellers to the ACT region. In a major first for the tourism sector, VisitCanberra has employed a full-time tourism professional in Singapore to promote Canberra as a leisure and business destination. It’s also the first official appointment by the ACT tourism body of an employee in a major international market. With visitation growing following the successful direct international flights between Singapore and Canberra, VisitCanberra’s Director Jonathan Kobus said having someone based “on the ground” in Singapore to spearhead leisure and business visitation was a logical next step following recent successful trade missions. “This new appointment is going to be really fantastic for the Canberra region,” Mr Kobus told Region Media. The new VisitCanberra representative will be based in the Tourism Australia Singapore office, guaranteeing strong relationships with state and territory teams already based in South East Asia. The team member will also work closely with Canberra-based staff to help build our future tourism strategies. “The awareness across the Singapore business community has now taken shape – so the timing is really good for having someone there because we’ve kind of done a lot of work setting up the base level knowledge,” Mr Kobus said. The representative – who is yet to be named by VisitCanberra – will be responsible for servicing Canberra’s three key “inbound markets” including Singapore, India and Malaysia. Canberra and the ACT region has enjoyed significant year-on-year growth in leisure visitation from Singapore, Malaysia and India with data from the most recent International Visitors Survey showing an 18 per cent increase in visitors from Singapore, a 55 per cent growth from India and 10 per cent from Malaysia. Having someone in Singapore with knowledge of the surrounding regions and engaging every day with the local community will be a real gamechanger, Mr Kobus said. 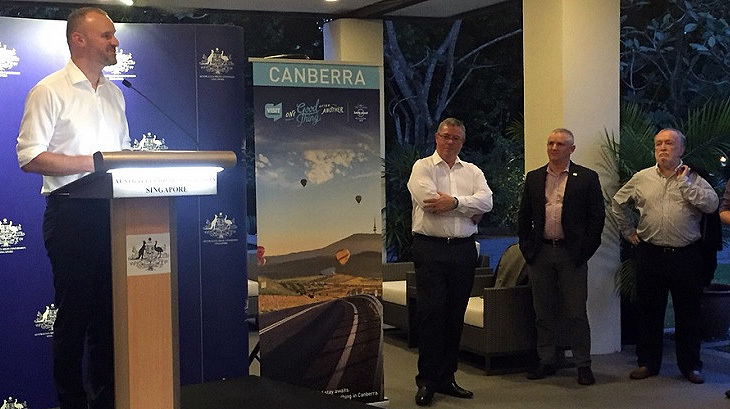 Trade boost – ACT Chief Minister Andrew Barr spearheaded a Singapore trade mission last July involving business leaders including representatives from Canberra International Airport. Photo: Canberra Business Chamber. “The local Singaporean is very well connected and has already built all the key relationships – so we believe having them in the role can really take it to the next level,” Mr Kobus said. “This representative will help open doors to new opportunities for Canberra. “It’s a critical step for us as we’re competing with all the other States – including Victoria, Queensland, South Australia and WA – who all have people permanently based in Singapore. Mr Kobus said there would be a lot more value from the new appointment through continued support to raise awareness of Canberra as a destination and our ability to deliver “one good thing after another”. “It [appointment] is also to provide market insights and local knowledge to support tailoring our future messages to this region. This team member will work closely with their Canberra-based colleagues to ensure we have a known and trusted person in-market to help open doors and build our future strategies,” Mr Kobus said. In another exciting development in the wake of the Singapore appointment, there’s also talk in tourism circles about also appointing someone based in China, which is a growth market. The ACT’s first Commissioner for International Engagement Brendan Smyth recently said the ACT would really “like a direct flight to China” given about one-fifth of the ACT’s international tourists come from China. As part of Canberra’s International Engagement Strategy, the three cities being targeted for flights include Beijing, Guangzhou and Shanghai. A “slowly, slowly approach” is being adopted, Mr Smyth said. Mr Kobus said the ACT would participate in Tourism Australia’s onshore activities in Asia including the recent Aussie Specialist Program training in Singapore as well as take part in the Tourism Australia Malaysian roadshow coming up soon.